A while ago I received the new By Wishtrend Mandelic Acid %5 Skin Prep Water for reviewing purpose by Wishtrend. I’ve tested it for quite some time and I’m almost through the bottle and I’m positive about this product so far. 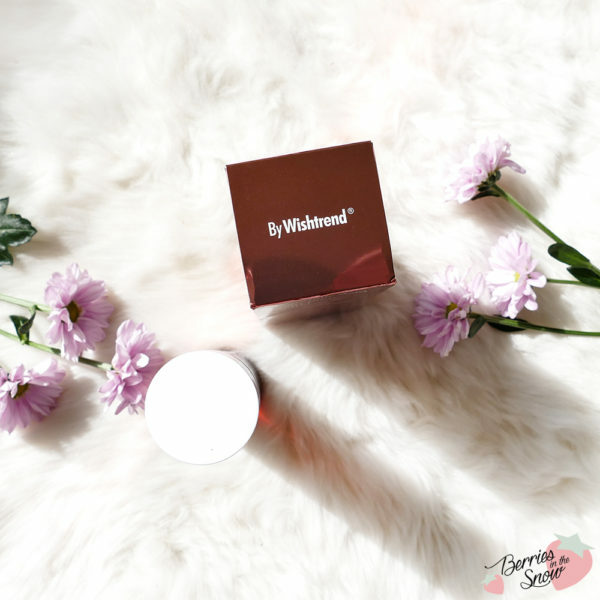 Probably, you know that Wishtrend does not only sell other Korean brands but also has a step in the beauty industry itself. Apart from known brand names Klairs or Jungle Botanics they also have products named under the brand “by Wishtrend”. Well-known products from By Wishtrend are the Vitamin C 21.5 Advanced Serum or the Natural Vitamin 21.5 Enhancing Vitamin Mask. 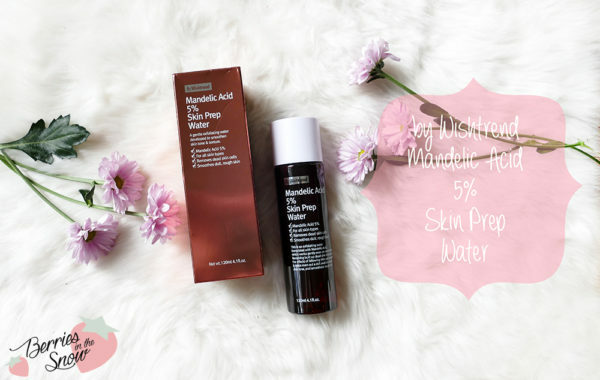 The Mandelic Acid 5% Skin Prep Water is the newest addition to the By Wishtrend product family. Is this a toner? Yes and no! It is a hydrating liquid to treat your skin after cleansing and acts as mild chemical exfoliant. This prep water uses a low concentration of mandelic acid for exfoliating your skin. In contrast to harsh AHAs and BHAs Mandelic Acid is a mild AHA with a large molecular size, so it is better suited for people with sensitive skin or people who want to start incorporate chemical exfoliant into their skincare. It has antibacterial properties and helps to reduce pigmention of the skin. Panthonol, Beta Glucan, and Sodium Hyaluronate are acting moisturizing and hydrating. Centella Asiatica Extracta acts regenerating on damaged skin. Licorice extract helps to even up the skin tone and acts soothing. You can check out the ingredients analysis on Skincarisma, too. 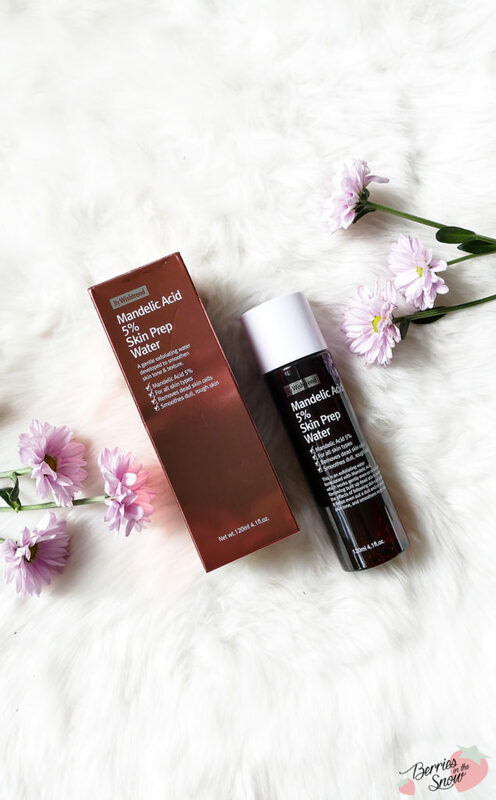 I use the By Wishtrend Mandelic Acid %5 Skin Prep Water after cleansing my skin. I pour the clear and watery liquid on a cotton pad and swipe it over my face, especially over my T-zone. Afterwards I continue with the rest of my skincare routine. Sometimes, I also add a toner after using the Skin Prep Water to add some additional moisture. I discovered that this mild exfoliator doesn’t irritate the skin at all, but yet it makes the skin feel softer and smooth. When I started using this again after my vacation I felt that it made my freckles disappear really quickly. It doesn’t have any special scent to it and absorbs quickly, too, without any trace of stickiness. 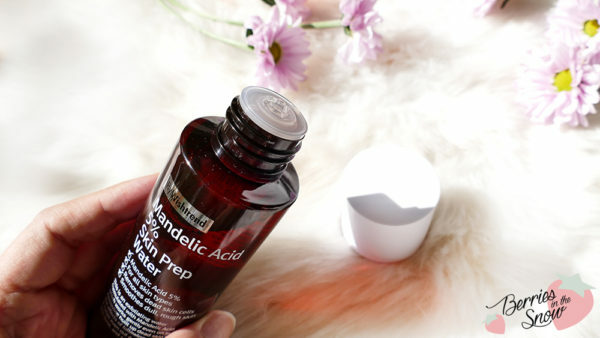 I use the By Wishtrend Mandelic Acid %5 Skin Prep Water in the evening almost every day. During day I use a Vitamin C serum. I’m wearing sunscreen during day aswell. I came to like the By Wishtrend Mandelic Acid %5 Skin Prep Water very much. It is a mild exfoliation and a perfect start to get your skin to like AHAs. It makes the skin soft and smooth and can be used along with my regular skincare routine without any problems (if you are interested in what products I’m using you might want to check out my Instagram account where I share my skincare from time to time. 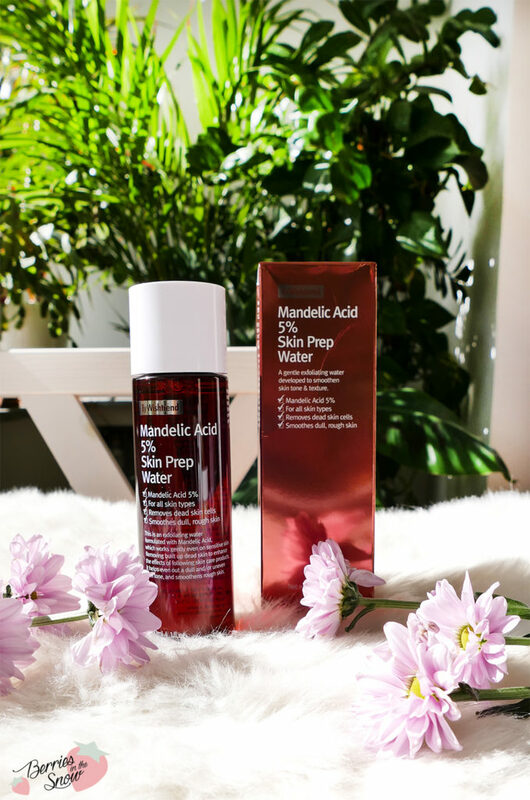 If you are curious about the Mandelic Acid 5 % Skin Prep Water , too, it retails for 22.00 US$ and is available at Wishtrend. Also keep in mind the friend-referral program from Wishtrend: You can receive a 5 Us$ referral coupon if you use my invitation code 17939205 upon registration and you’ll receive this voucher immediately. There will be a specific field in your registration form called “friends invitation program” where you can put the code mentioned above. This way new customers can safe 5 US$ which is a great possibility to safe some money. Also, Wishtrend has a Free-Shipping Area, were you can find products that can be bought with free shipping. Check out my post on the current Wishtrend Coupons. 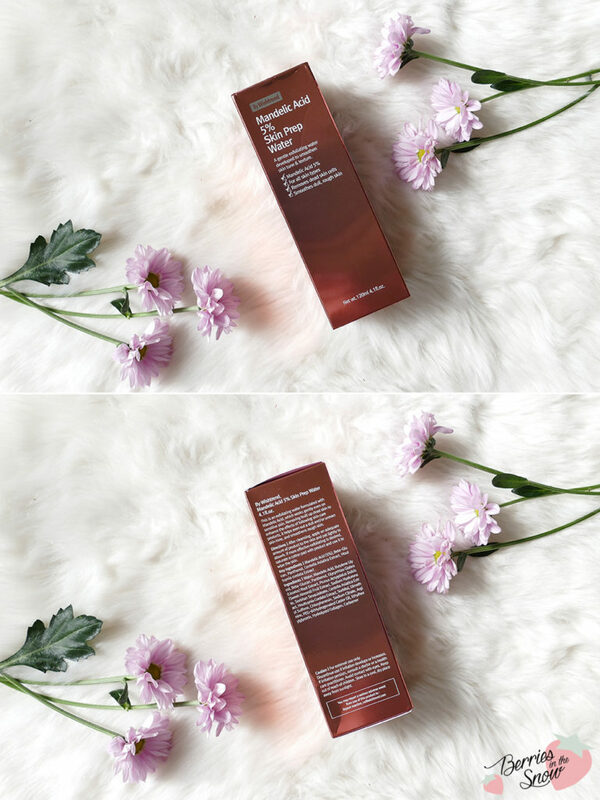 Until end of October you can try out the Skinmiso Spot Repairing Serum worth 24.99 US$ for FREE (you only have to pay the shipping costs) with the code >> SPOTFREEOCT <<! What is your opinion on chemical peeling of the skin? Do you use AHAs/BHAs? Would you consider Mandelic Acid as an alternative? Ich kannte die Marke noch gar nicht, aber die Produkte klingen wirklich sehr vielversprechend! Die Marke kannte ich bisher auch nicht, aber schön immer mal etwas Neues zu entdecken. Das Produkt klingt auf jeden Fall spannend.